10 Best Travel Organizers – What Should You Choose? With a minimal investment, you can be comfortable, and organized while traveling with the travel organizers. To assist you in making the right decision; below is a review of 10 best travel organizers available online. Even though the list counts down, it doesn’t necessarily mean that the number #1 is better than the number #10. The Zoppen RFID Travel Wallet & Documents Organizer can be said to be a cross between a scaled down briefcase, a purse, a carry-on, and a wallet. The result is a highly efficient travel passport holder wallet. This RFID travel wallet serves both as a document holder and a wallet, saving you a great amount of time. The Zoppen RFID travel organizer has a high-quality construction, made of high-quality, eco-friendly PU leather and faux suede. On top of that, the Zoppen meets a number of quality standards such as Euro REACH and CA Prop 65, so you are assured of the quality of its build. In addition to having your back, the Zoppen RFID Travel Wallet protects you and your personal information through it RFID protect feature. This feature blocks RFID waves up to a frequency of 13.56MHz, and still maintains its functionality while doing so. At the stated size of 7.5 by 5 by 1 inch, you would never know how much the wallet can hold. It has a number of compartments for all sorts of travel gear such as passports, boarding passes, ID slots, and SIM card pouches among others. It has an attractive appealing design and is available in a number of colors to meet different preferences. The idea behind the BUBM Double Layer Electronic Accessories Organizer was to create a product that looks good and offers the best functionality. This travel organizer is made of heavy-duty, waterproof and durable nylon exterior that not only looks good but also makes it very durable. The inside of the BUBM has two layers, hence the name “Double Layer”. The two layers, on top of increasing the room available for storage, increase the versatility of the unit. The first layer is mostly for storing small to medium-sized objects and consists of 9 mesh pockets and eight elastic loops. The second one, designated for larger items, has a neoprene soft sleeve which is a perfect fit for the iPad mini, three padded dividers, and two large mesh pockets. It can be used to organize a lot of items such as adapters, scissors, makeup, memory cards, chargers, and passports among others. Almost everyone seems to enjoy this product. However, the mesh on the pockets doesn’t stretch like in similar models. Manufactured from durable, lightweight, and quality nylon with padded semi-flexible covers, the ProCase Travel Gear Organizer is a practical travel bag that allows great flexibility when organizing your luggage. The main compartment offers a large enough volume to store USBs, SD cards, SIM cards, cable, smartphones, and money among others. The ProCase Travel Gear Organizer has multiple elastic loops and mesh pockets for added flexibility when storing your essentials. The flap that closes the case has two zippered pockets that offer more room. However, these cannot be used to store bulky items as it may not close well. On the downside, the ProCase Travel Organizer, while it is perfect for small items, may not work as well for bulkier ones. Loading it with bulky items may prevent it from completely closing. Otherwise, it is a very good product. 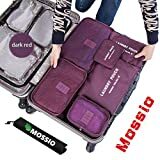 The Mossio Multifunctional Compact Clothing Packing Cube is ideal for people with an active lifestyle including backpacking, traveling, gym, yoga, beach, camping or traveling. It is made of premium quality nylon fabric and fitted with two-way YKK zippers and stitching, easily making it one of the best made and durable bags available. The nylon fabric is water and abrasion resistant, ensuring that your items remain safe, and stain free throughout your journey. This one of the best travel organizers comes with a complete set of seven including a storage bag, offering you utmost convenience and versatility. The set allows for easy storing and division of user’s luggage, minimizing the time spent on packing. With the large interior volume, you have all the space you need for your luggage. Additionally, each unit in the set has a meshed fabric at the top for easy identification of what has and what hasn’t been packed. Compared to similar travel organizers bag, the eBags Pack-it-Flat Toiletry Kit is quite large. This large size allows for more functionality, as well as give you all the space you need. Apart from the features common in all travel bags such as durability, compactness and high-quality materials, the Pack-it-flat travel bag brings to the table a number of lovable features as discussed below. The first is its flat design. Despite the extra size, the flat design on the eBags Pack-it-Flat makes it feel like it has taken less space than it actually has. It also makes it easy to lay it in a suitcase and simplifies access. All the items are placed in one layer, so you don’t have to dig through to find what you are looking for. Second, the central compartment is quite spacious. It can fit large items such as shampoo, deodorant, brushes, and soaps. Third, the side compartments, even though narrower than the central compartment, are also spacious. The left compartment is waterproofed and can be used to store water-sensitive items. Last but not least, I love that these travel organizers includes a hanging hook for convenience. The bag is available in a number of colors so you can pick one that matches your luggage and packing cubes. This Portable Travel Makeup Cosmetic Bag by Mr. Pro is made of a high-quality polyester fiber with a PVC backing to withstand wear and tear. It is available in a wide range of colors – possibly the largest on the entire guide to meet different preferences. The bag, although labeled “cosmetic bag”, is not for women ONLY. It can be used by men, as well as children as it is compact, practical, and makes use of high-quality zippers to last a long time of continuous use. Its zipper is strong and sturdy and glides easily. The Mr. Pro travel organizer brings together the highest level of workmanship to bring a very quality product that offers 30% more storage capacity. The materials used to make the unit are entirely waterproof, so you don’t need to worry about the penetration of moisture. For added convenience, a hanging hook is included in its design, to save space. The Zoppen Multi-purpose Rfid passport wallet is definitely inclined more towards a female audience and it actually looks pretty sleek. Even though compact, the unit has room for just about anything. 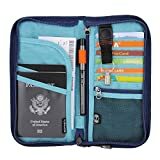 The passport slot on this travel wallet can hold up to three passports, making it ideal for parents who are traveling with kids. The Zoppen travel organizer is made of a high-quality leather fabric with stylish interior cuts and lines. It is available in a number of colors to meet different preferences. In making a small travel passport wallet that has a little bit of everything, predictably, a few sacrifices were made. To begin with, the credit card is tight and can only fit one per slot. It is not so big a deal, but it would do the wallet a lot of good if they allowed room for doubling up. Second, the smartphone space is somewhat small allowing a maximum of 5.8” displays. This, although not a problem to compact smartphone users, is a huge turnoff for larger phone users. If you are looking for a relatively lightweight, practical, and durable cubes for organization and travel, then the Bagail 4-set packing cubes may work for you. 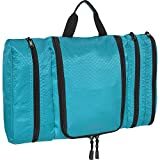 These travel organizers come in a set of four to make sure that everything is organized and you have enough space to store all your luggage in. the unit even includes a laundry bag to ensure that you do not leave out your dirty laundry. They are made of sturdy, high-quality nylon that makes it last for a long time without wear and tear unless improperly handled. Additionally, the 4-set comes with a mesh fabric on the top for ventilation, and to let you easily check what is and what isn’t inside. You are assured of durability, as it makes use of the very strong YKK zippers. Each bag in the set comes with a convenient handle to aid in carrying around. 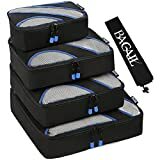 At a depth of 4 inches, the Bagail 4-set can be used to carry clothes, shoes, toiletries, electronics, and just about anything else that you want to carry with you. 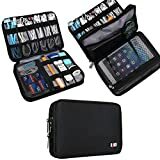 If the reason you are looking for the best travel organizers for storing any accessories, you may have just found the AmazonBasics Universal Travel Case a home. This travel case, besides other functions, has the capability to securely hold all your electronics and accessories. It offers plenty of designated areas to hold batteries, cables, chargers, and memory cards among others. 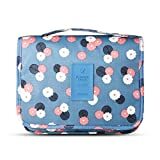 To maintain the scratch-free state of the packaged electronics and accessories, the interior of the bag is designed with a soft cotton jersey material. It is durable and has the capacity to resist wear and tear, thanks to its Molded-EVA plastic exterior. The AmazonBasics Universal Travel Case features the frustration-free packaging. This feature requires that the unit is designed without unnecessary packaging materials such as wire ties, plastic bindings, and clamshell casings. This design allows you to open and pack without hassle. On the downside, the zippers of these travel organizers that are used on this unit don’t seem sturdy at all. They are poorly made, and could potentially come off after a couple of trips. The packing system of the Shacke Pak – 4 Set packing cubes attempts to fix the biggest packing problem – fitting everything you want to bring with you. It saves a lot of space, allowing you to organize and store your clothes easily, simplifying packing and unpacking. This 4-set is made of a durable, high quality, water-resistant nylon fabric. This sturdy fabric is capable of withstanding wear and tear during travel. Additionally, it is reinforced using the X-Design web stitching. This feature works to prevent the nylon fabric from bending at the middle, allowing for more security for the luggage you have carried. With a 4-inch depth, you can comfortably pack a large number of clothes without crushing them or risking wrinkles. Finally, the bags use YKK zippers. Unless you have been living under a rock for the past couple of years, you know about the durability and sturdiness associated with these world-class zippers. For added convenience, a laundry bag is thrown comes with the 4 set. Forme, Shacke Pak – 4 Set Packing Cubes are the best travel organizers for all situation and everyone. As you may have noticed, the broad guide tried to look after all traveling needs. Whether you are traveling for business, pleasure, or you are looking for a versatile bag that can double up as a fashion statement, there is something for you in this review.